Aaron Hicks is on a tear. As of Tuesday he was leading the American League in OBP at .462, and is hitting the cover off the ball with a .362 TAv and .644 SLG. Hicks has forced himself into the lineup, starting the past six games. Although Judge, Gardner, and Ellsbury are already locked in as starters in the outfield, one is going to sit every game in favor of Aaron Hicks as long as his torrid pace continues. But will he continue? Is this the beginning of Aaron Hicks career as a solid everyday player, or just a great month? Let’s take a look at the major changes in Hicks’ numbers. As I mentioned before he’s leading the AL in OBP. Due in part to the fact he is walking a lot more. Hicks has already walked 16 times this season (17.4%), way up from his career walk rate of (10.1%). Take a look at his plate discipline numbers (Below) and sure enough you see Aaron Hicks has flat out stopped swinging. Among players with 80 PAs, his O-Swing% is the lowest in the league, Z-Swing% is 23rd lowest, and overall Swing% is 3rd lowest in the league. His current O-Swing and Swing% would have been good for lowest in the majors last season as well, by a margin of over 2 percentage points apiece. 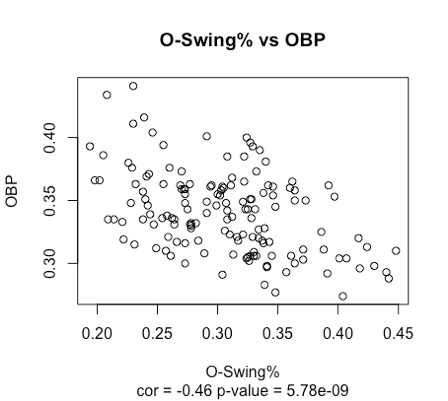 As you can see OBP and both O-Swing and Swing% are fairly well correlated and both serve as a very significant linear predictor of OBP as well (very low p-values). This is fairly intuitive. If a batter swings at balls less he is going to walk more, and get on base more. 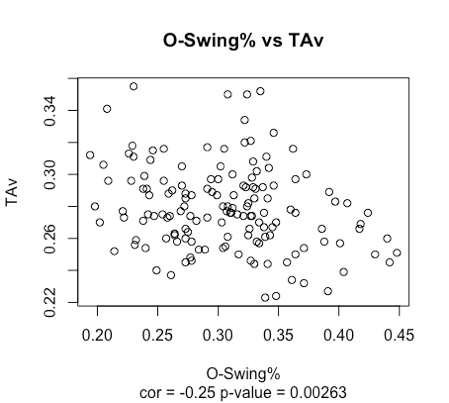 The relationship between TAv and both Swing% is less correlated but O-Swing% and Swing% serve as significant predictors. This one is also not hard to figure out. Generally, batters are not going to make good contact on balls out of the strike zone. 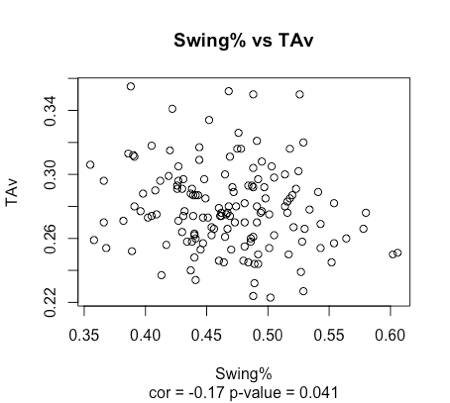 The more balls out of the zone they lay off the quality of contact, and the higher TAv. 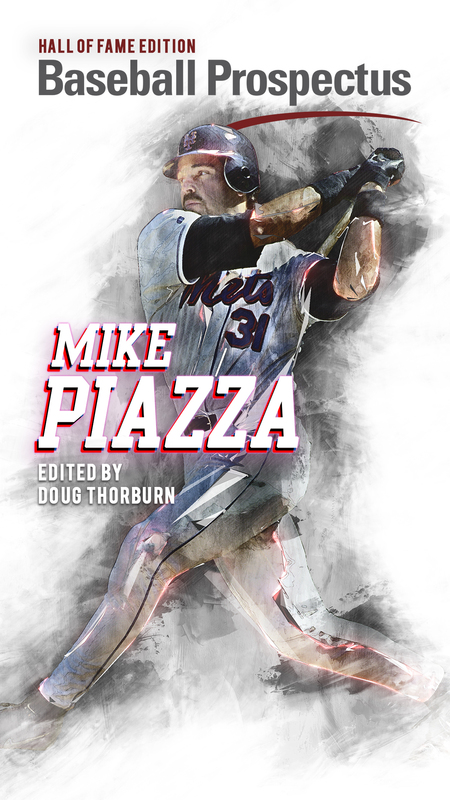 He has only a 44.8% Swing% on pitches in the lower third of the strike zone and has only swung at 9 of 14 pitches over the middle of the plate! Now this is a sign of regression to come for Hicks. Swinging at so few strikes is not good for power. 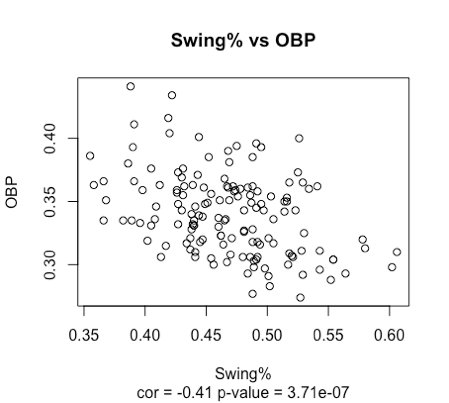 I looked last year’s relationship between Swing% and ISO and the linear relationship was minimal, cor = 0.021 p-value = 0.805. If a hitter is swinging less overall, it does not tell you much about their power. Hicks is not hitting the ball harder, he’s actually hitting the ball less hard. 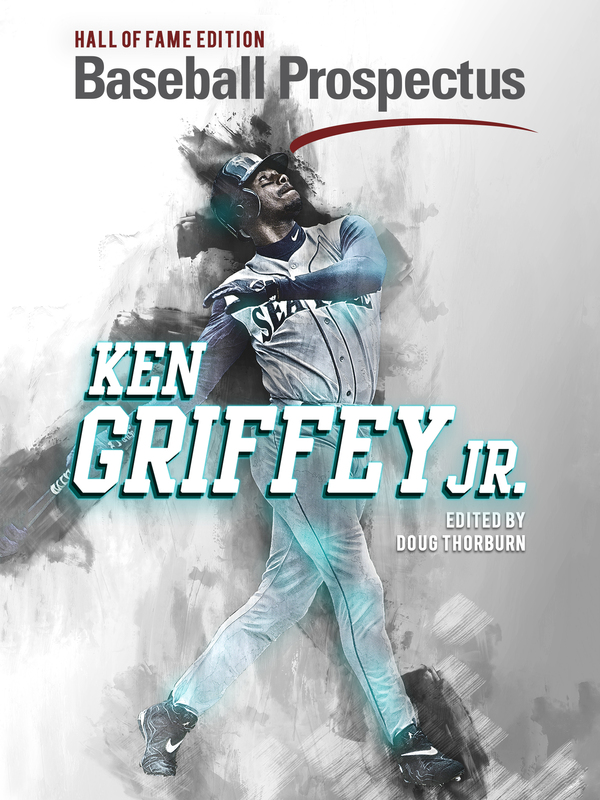 His Average Exit Velocity is 83.7 MPH down from 2016, (88.6 MPH) and below major league average, (87.0 MPH). Despite this Hicks is slugging at a very high rate. It is extremely unlikely for him to keep up this pace while he takes pitches middle-middle for strikes and makes relatively weak contact. This does not mean that Hicks is destined for the bench once again. If he maintains his swing rates he is going to continue to get on base at a high rate. A solid outfielder with a plus arm and an 15% walk rate is likely an everyday quality major league player. However, a player with a 53% Z-Swing% is not going to slug .500. Aaron Hicks might be for real, just not the slugger he has been thus far.